OSHA issued citations yesterday to three firms for hazards related to an oil rig explosion that killed five workers. 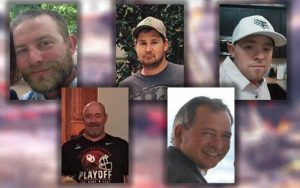 The disaster occurred on January 22 and caused the death of Roger Cunningham, 55, of Seminole, OK; Josh Ray, 35, of Fort Worth, TX; Cody Risk, 26, of Wellington, CO; Matt Smith, 29, of McAlester, OK; and Parker Waldridge, 60, of Crescent, OK. The rig was located in Pittsburg County, OK. Other workers at the drill rig heard heard a boom, saw a fire, and evacuated. (Left to right, top to bottom) Josh Ray, Matt Smith, Cody Risk, Parker Waldridge, and Roger Cunningham. It took emergency responders nearly 30 hours before they could recover the five workers’ bodies. They were located in the “doghouse,” which is the office used to control the drilling rig. Patterson-UTI Drilling received citations for six serious violations and a proposed penalty of nearly $74,000. OSHA cited the company under its general duty clause because it failed to maintain control of the well during drilling operations. OSHA indicated that the hazard could have been eliminated had the company followed the American Petroleum Institute’s recommended practices (RP 54, Section 6.1.1) to prevent kicks and blowouts. OSHA noted that this hazard could have been addressed had the employer followed ANSI/ASSE Z359.4 (i.e., safety requirements for assisted-rescue and self-rescue systems.) Patterson was also cited for failing to have an emergency response plan (as required by 1910.120) and for not having a back-up emergency alarm system (as required by 1910.165). Crescent Consulting received citations for three serious violations. The violations also related to failing to maintain control of the rig, failing to have an emergency response plan, and inadequate employee alarm system. OSHA’s proposed penalty is $36,600. Skyline Directional Drilling was cited by OSHA for one serious violation with a proposed penalty of $8,100. A heat lamp being used on the rig was not approved (the electrical wiring not safe) for a hazardous location (as required under 1910.307). Patterson UTI and Crescent Consulting were also cited for this hazard. Striving to adhere to industry standards is cop-out language. I’m striving to do a lot of things, but that hardly means I’m succeeding. Repeat: average rig margin per day is $8,270. The company currently has 176 rigs. The death of these five men was indeed tragic. It is also inexcusable.